This week’s Digital Dive assignment asks you to install a plugin on Firefox (preferred) or Chrome. I’ll show you how to install it and how it works on Firefox. At the bottom of this post is an alternate assignment that you can do. But I urge you if you can install the plugin to look at Collusion—it is a lot more revealing than the alternate assignment. You will not be able to install it on a school computer, only your personal one. 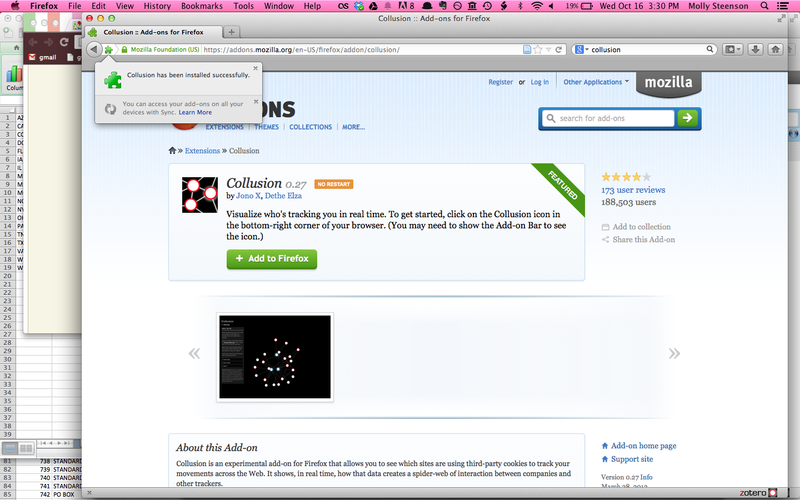 You can also install Collusion on Chrome, but it provides less information about the sites you’re visiting. It does not work on Safari on Macs. Install the Collusion web plugin to see what your digital trails reveal to the websites you visit. See this quick article for more information. (http://www.fastcodesign.com/1669188/firefox-plug-in-reveals-the-small-army-stalking-you-on-the-web ) What did Collusion make apparent? What sites and service are tracking you? Follow one or two of the tracking sites by typing in the URL in a browser. What do those companies do? What sites and companies are tracking you. How does this affect the ads and content that you see? What is your stance: do you find that they cause you to see relevant content, do you find them intrusive, or something in between? 1. 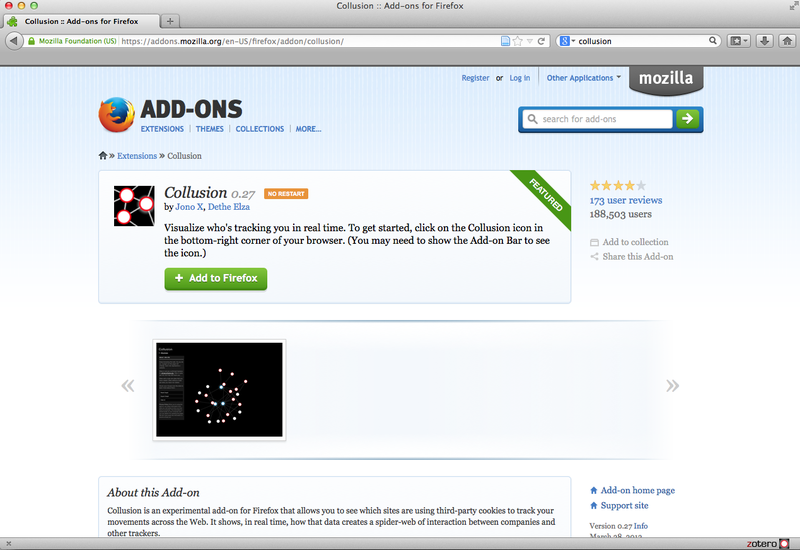 Go to https://addons.mozilla.org/en-US/firefox/addon/collusion/ and then click the green Add to Firefox button. 2. Click the “Install Now” button that appears, and allow the add-on to install. 5. Collusion will open. You’ll see a lot of little circles connected by thin lines. 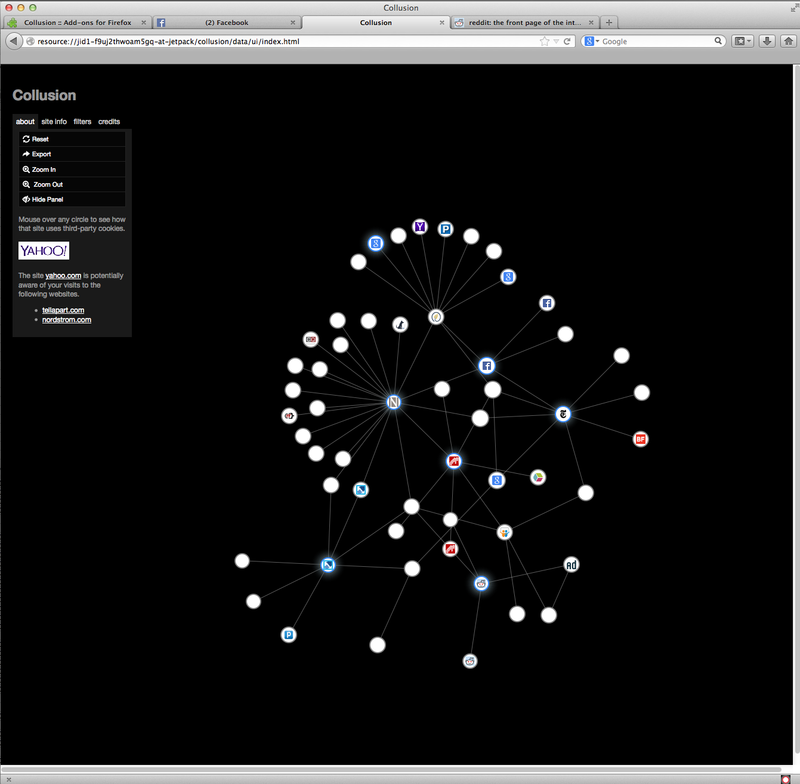 These circles are showing all of the sites that know about your browsing habits and are sharing information about you as you surf the web. You should now go and surf the web—visit the sites that you typically visit everyday. I looked at Facebook, the Onion, the class blog, Nordstrom, Reddit, the NYTimes, but you should look at whatever you typically visit. After you’ve visited a few sites, click the black and red Collusion icon in the lower right hand corner. You’ll see that your diagram has updated. Visit 10 sites that you might ordinarily visit as you surf the web, including Google and Facebook or another social networking platform if you use one. Log what ads come up. What patterns do you see? What Google AdSense ads or search results come up? Do you see ads from sites you visited? Where and which ones? In any case, you should answer what sites and companies are tracking you. How does this affect the ads and content that you see? What is your stance: do you find that they cause you to see relevant content, do you find them intrusive, or something in between?